If you thought the steep hillsides in Nordfjord are impressive to look at, why not impress yourself and climb them all the way up to the top?Admittedly, hanging from a steep mountainside above a fjord is not something you do every day, and you would think it sounds strenuous and somewhat dangerous. 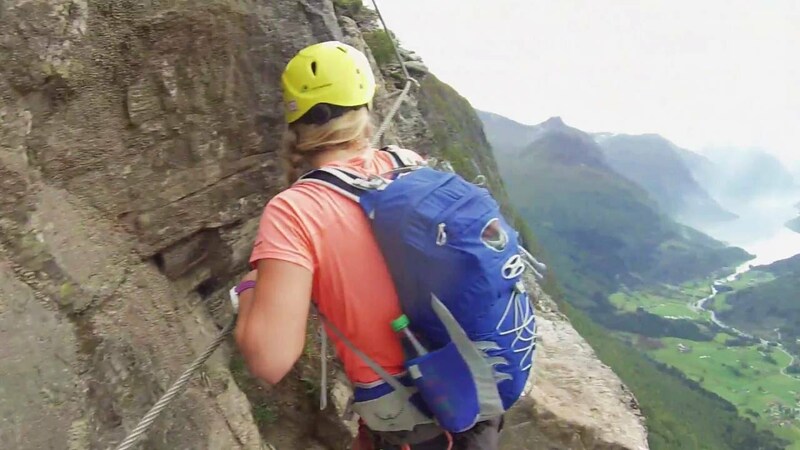 However, thanks to a well-prepared climbing track to the top of Hoven (1010 meters above the fjord), most people manage to climb the Via Ferrata trail (“iron road”) in Loen. A guide is with you all the way and with a harness attached, you can’t fall. It is just a matter of taking in the view! Via Ferrata Loen starts at Loen Active Base Camp and takes you up to Mt. Hoven (1011 m.). Fantastic views of beautiful mountains, glaciers and the fjord. Duration 6-7 hours. Return with the new Loen Skylift. Price: NOK 1.345 (2019), incl. guide, skylift-ticket, helmet and harness. The climb can be combined with lunch or dinner in the Hoven Restaurant. The popular Via Ferrata now has a new route – an extreme alternative with difficulty level F. With this new addition Via Ferrata Loen now has one of the most complete Via Ferrata facilities in Europe. This route is for experienced via ferrata climbers. Age limit: minimum 14 years, accompanied by an adult. 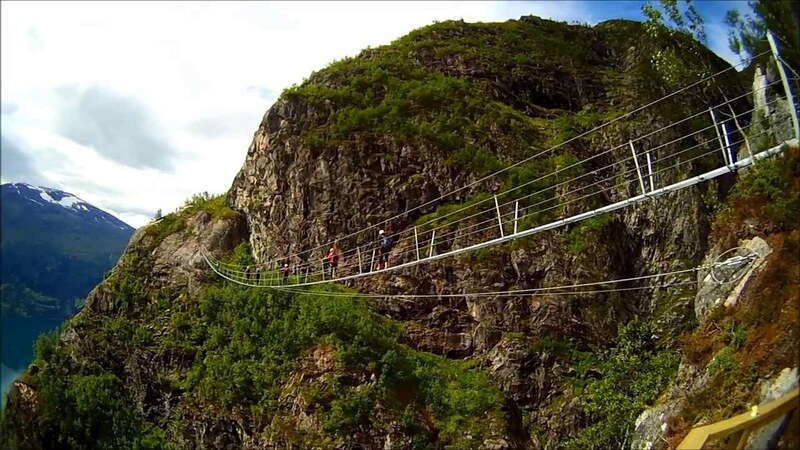 The new suspension bridge across a 160 meter deep canyon is 120 meters long, and is the longest via ferrata bridge in Europe. The bridge opened in August 2013. The walk across will definitely give you butterflies. The bridge is located at 750 m.a.s.l. To get there you have to climb the Via Ferrata Loen. The name Via Ferrata comes from Italy, where they built an "iron road" in the mountains during the first world war. The essence of a modern via ferrata is a steel cable which runs along the route and is periodically (every 3 to 10 metres (9.8 to 33 ft)) fixed to the rock. Using a via ferrata kit the climber can secure themselves to the cable, limiting any fall. - Forest road from the Alexandra Marina to an altitude of 170 metres. - Path through steep terrain from an altitude of 170 metres to 440 metres. - Gjølmunne string (wire bridge): 36 m. long. All hiking/climbing in the area is at your own risk. Book a guided tour with Loen Active. Guided tour in Via Ferrata Loen, including safety equipment and return with Loen Skylift: NOK 1345 (in 2019). VIA FERRATA LOEN IS CLOSED FOR THE 2018 SEASON. WELCOME BACK ON THE 1ST OF MAY 2019. Practical information - Forest road from the Alexandra Marina to an altitude of 170 metres. Path through steep terrain from an altitude of 170 metres to 440 metres. Walking time on forest road and path: 1 to 1 1/2 hours Altitude at start of Via Ferrata, 440 metres. Gjølmunnebridge 750 m.a.s.l. / 120 m long. Climbing metres, 950 metres. Cable length, 850 metres. Top of Via Ferrata – altitude of 880 - 900 metres Mt. Hoven, altitude of 1,011 metres. Return by Loen Skylift. Terms and conditions - Book a guided tour with Loen Active. Price included Via Ferrata equipment and guide NOK 1020 (2018). Transfer back to Loen on the cable car NOK 290 p.p. when on a guided tour. Warning - All hiking/climbing in the area is at your own risk. Guided tours are reccommended.